Microsoft has just released Build 14959 for the Windows 10 Creators Update that’s coming out next year. To get this build version, you need to sign up to the Windows Insider Program offered by Microsoft. The build is obviously still very buggy, so it is not recommended that you install it on your main machine. The best part is that Microsoft is already using the Unified Update Platform (UUP) to push this build through for developers, so you’re actually getting a preview of how much faster future updates will install on your system. The file size is significantly smaller, as promised by Bill Karagounis when UUP was first announced on Microsoft’s blog. You can download it for Windows 10 Mobile as well. Some issues we’ve seen with this first build are with Internet Explorer on PC; it seems to be crashing when you open the application or when using it to browse the internet. On mobile, you won’t be able to load additional language packs, keyboards or speech packs on your device. With the build 14959 and subsequent Insider builds for the Windows 10 Creators Update, we expect to see incremental additions of heavy features such as 3D application support, and possibly some collaborative functionality built in. 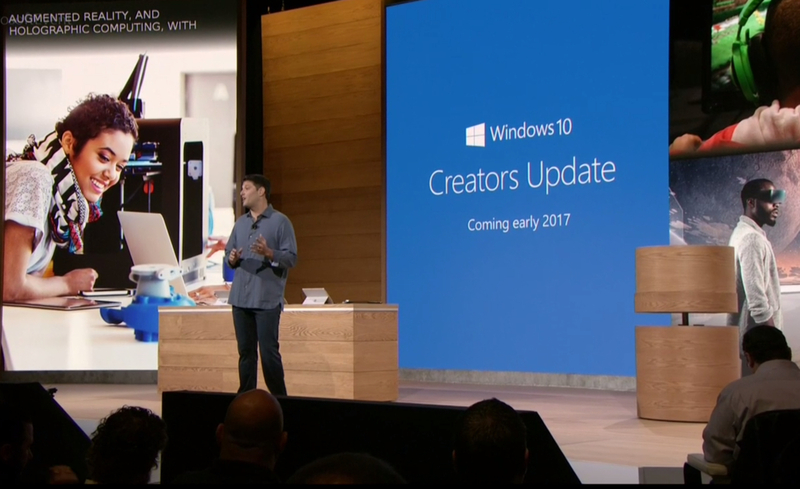 The whole idea behind the Creators Update, as the name suggests, is to give content creators a wide range of capabilities that are currently not available on Windows 10. Right now there’s Paint 3D, but Microsoft is clearly looking at some deep integration with mixed reality applications – its home-grown version of augmented reality apps – down the road. As for the builds, the purpose is to allow developers to have an early preview of the operating system’s new capabilities as and when Microsoft develops them. This also gives developers a clue to how they can modify their current apps for the Creators Update, and also create new apps that will seamlessly support 3D manipulation, virtual reality and even hardware components such as VR headsets and so on. They’ve also promised holographic computing capability, something that should be very useful for design teams in various industries. On the VR front Microsoft is already doing this for Windows 10 Mobile. If you recall, a few days ago the Alcatel Idol 4S with VR headset offer was accidentally revealed by T-Mobile a little earlier than expected – and right in the middle of Microsoft’s own Windows 10 event in New York. So 3D support, mixed reality functionality and increased collaboration capabilities are definitely a given for the Windows 10 Creators Update, but we’ll have to wait and see how Microsoft rolls out the features a few at a time. In the meantime, if you’re getting Build 14959, you can expect to see some options for scaling Hyper-V Virtual Machines. You should also be able to see several bug fixes like the Start option being able to be closed within the app switcher. You should also be able to see some general UI improvements, and better mechanics for launching apps from other apps in tablet mode. Over the next several build previews, we should see some of the more interesting functionalities being introduced. Remember, every build will have its own set of bugs, but that’s the whole point of a preview version – so these bugs can be identified, reported and fixed in advance of the Creators Update being launched to the general public next year. We’ll keep you up to date on the Windows 10 Creators Update front, as and when Microsoft pushes subsequent builds.